As a member of the Bee Gees, Barry Gibb sang and played the guitar along with his twin brothers Maurice Gibb and Robin Gibb. Among the group’s well-known hits are “How Deep Is Your Love,” “Night Fever,” and “Run to Me.” For more than two decades the band has produced hits. Their records have sold more than 100 million copies; they have produced more than 25 albums and have had at least 19 hits on the American music charts. Barry Gibb was born in England and emigrated with his family to Australia where the career of the Bee Gees began. The Bee Gees name came from the Brothers Gibb. Their debut performance was on Australian television in 1963 when they sang their first single, “The Battle of the Blue & Grey.” “Spicks and Specks,” another hit, went over big in Australia. Despite the band’s success “down under” they were envious of groups like the Beatles who had become internationally known by this time. In 1967, the trio went back to Britain to achieve national fame. With success looming in their path, Robin Gibb decided to leave the group in 1969 to pursue a solo career. Barry Gibb and his brother decided to keep the Bee Gees alive and produced the hit single “Tomorrow, Tomorrow.” The two performed on the television show Cucumber Castle singing “Don’t Forget to Remember.” Barry Gibb’s songwriting talents not only benefited the Bee Gees but also several other ’70s and ’80s singers such as Barbra Streisand, Dolly Parton, Kenny Rogers, and most recently, Celine Dion and Michael Bolton. By 1970, Robin Gibb had rejoined the group and a new decade was upon the Bee Gees. The early ’70s were hard on the group as the transition was happening between pop and folk-rock to heavier rock. Main Course, released in 1975, produced the band’s next hit, “Jive Talkin.” Their manager, Robert Stigwood, used these songs to enhance the trio’s popularity during the disco phenomenon. The Saturday Night Fever soundtrack brought about enormous popularity for the Bee Gees. Hits from the soundtrack include “Night Fever,” “How Deep Is Your Love,” “Stayin’ Alive,” and “You Should Be Dancin.” By the end of the ’70s, the group was once again on the charts. Do you want to hire Barry Gibb? Directly request a quote. In 48 hours we can send you the availability of Barry Gibb If you would like to book Barry Gibb, Entertainment Booking Agency is the right place. 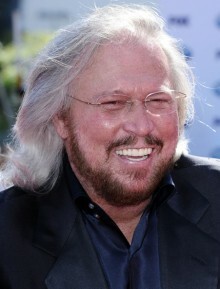 We will offer you the best price and contact the management or we directly contact Barry Gibb. For corporate appearances or speaking engagements you can contact our agents and the will help you true the process. Tags: hire Barry Gibb, Barry Gibb booking, book Barry Gibb, Barry Gibb appearances, find more information on booking Barry Gibb for appearances, Barry Gibb speaking engagements, Barry Gibb endorsements/spokesperson, Barry Gibb appearance fees, Barry Gibb booking agency contact info, biography of Barry Gibb, Contact an artist booking talent agent find a speakers bureau that can book Barry Gibb, speaker booking agency for Barry Gibb, Barry Gibb booking agency, Barry Gibb booking for corporate event. EBA is one of the biggest entertainment booking agencies in the World. We book hundreds of celebrities, artist, athletes and speakers in a year. Important to know is that we are not claiming to be the management of Barry Gibb. We are not the official agent for Barry Gibb. Companies from around the globe book these artists and speakers true our company be course we have one of the biggest networks and we always have direct contact with the artist or the management. We help you to find the right celebrities for your corporate of private events. Please contact one of our agents to get free advice and we will help to get the world-famous artist on your party.